Cucumber Mint Yogurt Sauce is light and flavorful and will pair beautifully with your summer dinners! It’s time for some Fitness from Miss Nichole over at Pure Clean Fitness for Fit Friday!! Cucumber Mint Yogurt Sauce is the sauce to our Grilled Tandoori Style Chicken from last Friday! It’s simple delicious and the perfect dipping sauce for so many BBQ summer recipes! Also try our Greek Lamb Burger with Yogurt Mint Sauce, Truvía® Nectar Strawberry Yogurt Parfait, and Amish Oatmeal Greek Yogurt Parfait! Amazon is a great place to buy those “hard to find ingredients”, so here’s where to find those Fresh Mint Leaves! Cucumber Mint Yogurt Sauce is flavorful just like our Thai Chicken Flatbread with Cilantro Yogurt Sauce. They are both so yummy I can’t decide which one I like more! If you love yogurt sauces, you’ll LOVE these!! Happy Fit Friday on this Memorial/Summer Kick Off Weekend! We are antsy to get outside and play, no school to worry about, and plenty of warmth coming our way. And we are starting the weekend off right with a healthy recipe from Ruthie and some fit tips from yours truly, I also might sneak in a short workout. 1. Plan a wingman early on. Someone that is fitness and minded and will help you stay on the right track. 2. Take a healthy side dish to share with everyone. 3. Limit your alcohol intake. You don’t need to spend the entire weekend drinking, its totally not worth it. 4. Drink lots of water. This will help with the snackage, the alcohol, and it will be warm outside. 5. Be sure to get your workout in. I will be heading out the The Remembrance Run 10k, my little guy will be heading out for a 1 mile race, and my hubbie will be heading to the Crossfit gym for Murph. You can also head out for a hike, bike ride, or other fun outside time either solo or with the family. If your weekend is just too jam packed keep on reading for a short Tabata workout to sneak in early. 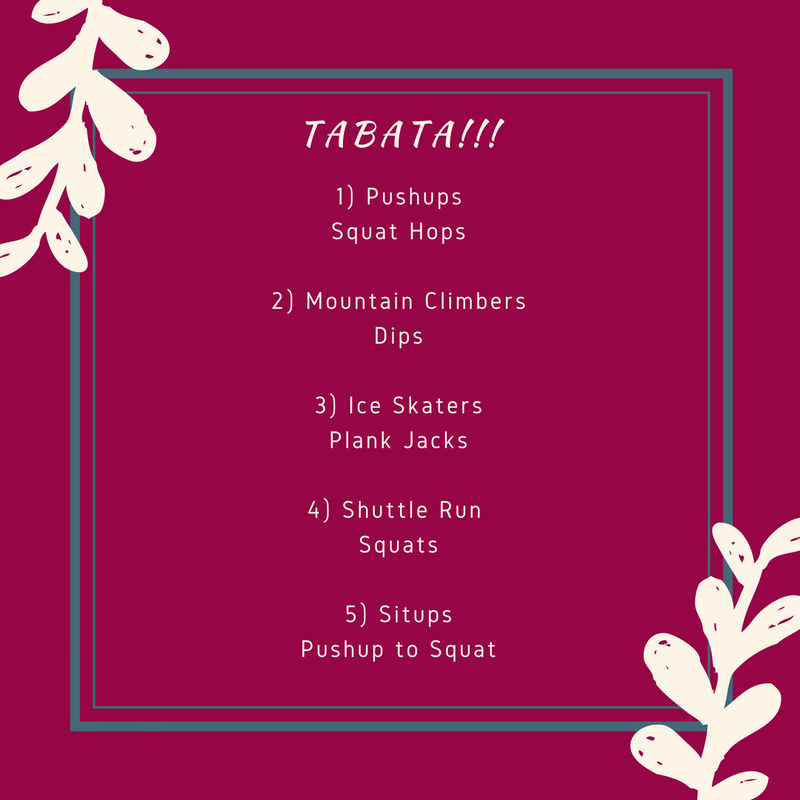 Quick Tabata reminder; Tabata is an all out interval workout. Each round is 4 minutes of 20 seconds on with a 10 second breather. Cucumber Mint Yogurt Sauce is simply delicious and is the perfect sauce for anything! In a small bowl combine yogurt, cucumber, garlic, cilantro, mint, and lemon juice; mix to combine. This sauce looks tasty! However, there’s a mistake in the recipe, isn’t it? It has to be “cucumber mint yogurt sauce” instead “Cilantro Yogurt Sauce”? !